Tonight we’re eating salmon filets marinated with lemon, balsamic vinegar, ginger, and fresh jalepenos. 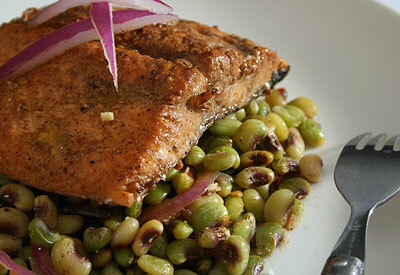 The salmon is served with purple hull peas that have been sauteed with red onion and ginger, and then baked beneath the salmon to infuse the rich flavors. T: You’ve been cooking up some fine fish since we started eating seafood. A: not that you mean to say that we just started eating seafood, but we did just start budgeting it into our meals. But, thank you. I appreciate that. T: Man, that salmon had a delightful flavor. And I loved the kick it gave at the end. A: that’s the jalepeno that was in the marinade. Fresh jalepenos pack a mighty punch, if I do say so myself. T: They pack a wonderful punch that isn’t overwhelming. A: exactly, it’s just a nice warming heat all around your mouth. T: we also had artichoke, and it was terrific as usual. A: I just had a little bug fly up my nose. Crappy. T: so what did you rate this one? A: I give this meal an 8.447/10. It was good, but my particular salmon filet was a little on the medium-well side when it should have been medium, max. T: I give it a 9.1/10. The vinegar in the peas was a little on the strong side, although I admit I’m a sissy about balsamic vinegar. A: Yeah, definately a wimp. T: seriously, everybody goes nuts about all these vinegarette dressings, and I just don’t get it. A: well, between you me and whoever’s reading this silly blog, balsamic vinegar wasn’t the only vinegar in those hull peas. There was also a lime and taragon vinegarette poured over the entire shebang. T: so, this meal seemed pretty healthy, is that correct? A: very true. There was maybe a total of 3 or 4 tablespoons of olive oil used in the whole meal, so the only fat added was reasonably good-for-you fat, and the salmon always provides a lot of omega-3 fatty acids. The purple hull peas are just a fantastic source of fiber. T: I’m not sure if fiber is something that I need a whole lot of. A: yes it is. Everybody needs a lot of fiber. Fiber is a natural cholesterol reducer, as well as helping your g.i. track stay healthy. T: I thought it was just good for staying regular. A: Nope, fiber does a lot more than just that. EVERYONE: eat lots of fiber! Love to try. Where is your recipe?